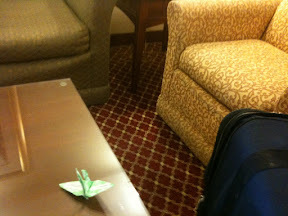 What's more convenient than releasing a crane while the hotel is releasing your money during check out? Not much, especially if you're checking out at the crack of dawn along with a bunch of others. It was a little later than the crack of dawn but I wanted to get as early a start as I could for my drive from Wilmington to Charleston. For someone not really a fan of driving, the 3+ hours was a wee bit daunting. But it turned out to be absolutely fine.